I highly recommend BirdTalk magazine as one of the best sources of information pertaining to pet birds. I've subscribed to BirdTalk for almost as long as I've owned birds. It's been a great educational tool for me, as I know it will be for you. Subscribe or pick up a copy at your local news stand. Numerous bird oriented Usenet newsgroups exist that you can read and participate in. Come join us on the rec.pets.birds news group! It's entertaining and informative, and you get to meet a lot of great people who love and are owned by pet birds. Some of the experiences they share are priceless! I've provided links for your convenience. How to properly clip your bird's wings... and much more. If you're even CONSIDERING getting a Cockatoo go here and TURN UP YOUR SPEAKER VOLUME!! The "Hot Spot" for birds. Parrot postcards, backgrounds and other neat bird lover goodies. One of the most informative and best designed bird web sites I've seen. I highly recommend this one! Avian vets address health issues. Locate a vet and much more. Excellent source for info! Report lost and found birds. Get help from avian vets and behaviorists. Meet Dan's birds. Photos and lots of info. See a parrot hatch right before your eyes! - Laugh, learn, share, and explore at this award-winning site. Pet care library for dogs, cats, birds, and exotic pets, pet loss support resources, postcards, classified ads, fun, games, contests and cool stuff all from this AAHA-accredited animal hospital. Experienced, dedicated breeders of quality exotic birds. Home of the Congo Grey. Terrific! Tons of good stuff! If you love animals and nature, you'll love this site! 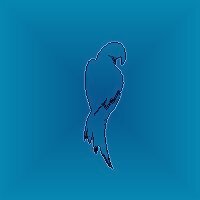 An excellent resource for looking up pictures and info about any parrot species. The ultimate pet links site! Links to web pages offering good info and advice on caring for birds with mental and physical challenges. Communication With Parrots: Meet Alex, the famous amazing African Grey! Fascinating research by Dr. Irene Pepperberg! Bird mailing lists and more. Bird behaviorist, Sally Blanchard gives expert advice for correcting behavioral problems. If you've lost a dear pet, these inspiring words will bring you comfort in your time of grief. Author Gail Martin's web site. Packed full of bird stuff... from postcards to Avian Vet referrals. Chat, links, books, poems, classifieds and more! You gotta see this! Find everything you want to know about birds. One of the best sites on the 'Net! Meet this charming Double Yellow Head Amazon and his loving family. This site is truly inspirational to all animal lovers, and is a pleasure to visit again and again.